About this Glass Award:A beautiful burst of fireworks inside glass! This award is part of our Art Glass Collection and is truly unique! Each piece is an individual work of art; size and color will vary. Materials: Art Glass NOTE: Product comes with Prop 65 warning label when shipped to California. Label reads: "WARNING: This product may contain carcinogen, which is known to the State of California to cause Cancer and Reproductive Harm. For more information, go to www.P65Warnings.ca.gov. About this Color Splash Award:Due to handmade production method, these pieces may vary slightly in height and overall size. Materials: 24% Lead Crystal NOTE: Product comes with Prop 65 warning label when shipped to California. Label reads: "WARNING: This product may contain carcinogen, which is known to the State of California to cause Cancer and Reproductive Harm. For more information, go to www.P65Warnings.ca.gov. About this Zenith Award - Vertical Large:Chrome-plated star. Reward the rising stars of your organization with this inspiring award. Materials: Award: Optical Crystal, Star: Zinc Alloy with Silver Electroplating. About this Color Accent Crystal Tower:Due to handmade production method, these pieces may vary slightly in height and overall size. Materials: Optical Crystal. Blank goods not available NOTE: Product comes with Prop 65 warning label when shipped to California. Label reads: "WARNING: This product may contain carcinogen, which is known to the State of California to cause Cancer and Reproductive Harm. For more information, go to www.P65Warnings.ca.gov. About this Arco II - Medium Arch:Medium crystal arch award. Finish / Material: Crystal. PLEASE NOTE: Each crystal product is handmade; the size and weight may vary from piece to piece.Special Instructions:Personalization: Per piece personalization $8.00. Setup: $56.25. About this Arco III - Large Arch:Large crystal arch award. Finish / Material: Crystal. PLEASE NOTE: Each crystal product is handmade; the size and weight may vary from piece to piece.Special Instructions:Personalization: Per piece personalization $8.00. Setup: $56.25. About this Escuro III - Large Star:Large crystal star award. Finish / Material: Crystal. PLEASE NOTE: Each crystal product is handmade; the size and weight may vary from piece to piece.Special Instructions:Personalization: Per piece personalization $8.00. Setup: $56.25. About this Stellar:Stellar is a great award for your shining stars! Available in clear and green. Materials: AcrylicSpecial Instructions:Laser Etch Personalization $3.00 per line, per piece. Thank you Diane, Nicolas and Sandy! 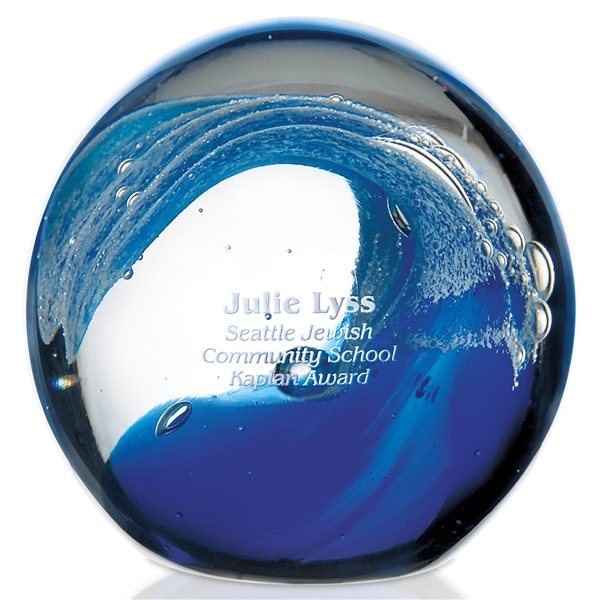 Our promotional Jaffa Round Glass Wave Award is a great item to giveaway to those highly recognized. The Jaffa Round Glass Wave Award is a beautiful glass wave piece made out of exceptionally clear glass. Give your recipients the top selling custom award in this category. Thank you Bryan and Creed for your reviews on our promotional Firmada II - Blue Globe. We are glad to hear how well they are. Our Firmada II - Blue Globe is another beautiful award to giveaway. Give these to teachers or entrepreneurs for doing the most! They’ll love to have these! 3" blue crystal globe on clear crystal base. Order your Firmada II - Blue Globe here. In our wide selection of custom awards, we have many great options to help you recognize your customers or employees. We have glass awards, acrylic awards, globe awards, cylinder awards, crystal awards, and more! Custom awards are great for recognizing your top customers or employees. Give them an award they can be proud of. They’ll want to cherish their awards forever! Promotional custom awards are great for everyone! Make your customers or employees feel special with our custom awards. Look through our selection of custom awards. Shop here! Here at AnyPromo, we always aim to make your event a huge success! 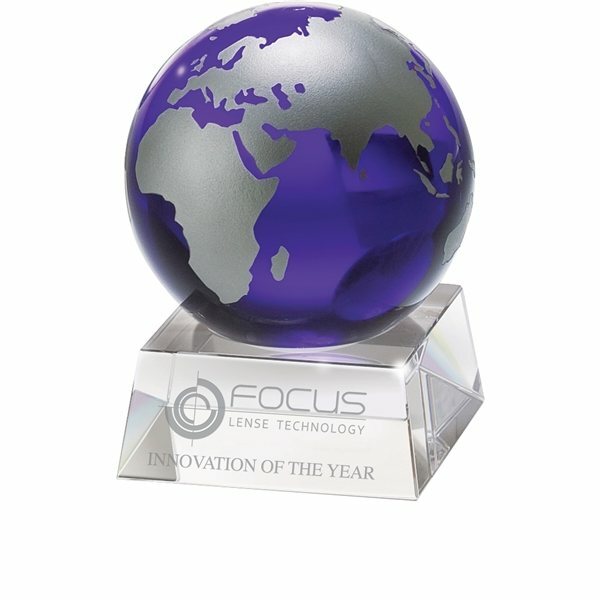 Search our custom awards inventory to find what best fits your promotional needs. Custom awards are perfect for recognition. If you want to acknowledge a teacher, student, employee, or customer then a custom ward is definitely your best option! Custom awards can make anyone feel happy! We have different styles of custom awards available in our selection. Select the best fit for your company. Below you’ll find a list of some of our trending promotional custom awards. Every item is available and waiting for you to order. Promotional custom awards are great to give to those who deserve recognition. Awards are meant to be given to those who deserve it! Thinking of recognizing someone special? Custom Awards are the perfect promotional item to give to them! Our featured list of custom awards are trending in this category. You won’t want to miss out on checking these options!